For some, McDonald’s is just a quick place to grab some lunch, but for others it’s a way of life. 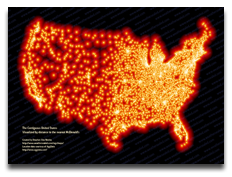 Based on this map by Stephen Von Worley, I’m going out on a limb and saying Micky-Dee’s is probably a way of life for more people than are willing to admit it. Friends have been hounding me for years — actually, two seasons, but who’s counting — to watch The Big Bang Theory. Everyone kept telling me how amazingly funny the show is, how I’d be able to see my world played out in the characters, and how the geek and nerd factor would be right up my alley. Yes, they were all right, but it still took no end of cajoling on the part of my friend Lesa Snider King and the gifting of season one from the iTunes Store before I started watching.